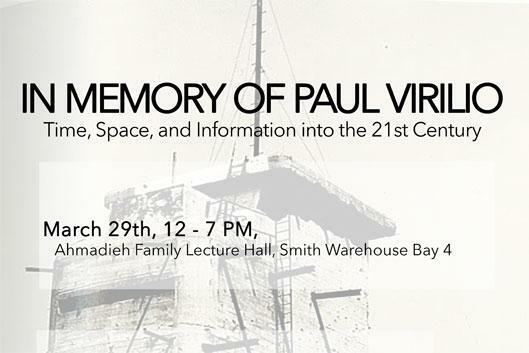 In Memory of Paul Virilio: Time, Space, and Information into the 21st Century" is a day-long conference memorializing Paul Virilio, who passed away last fall. Virilio's work-which traversed architectural theory, military history, the philosophy of technology, film theory, and more-theorized the compression and logistical reorganization of space-time by twentieth century military and information technologies. This conference considers the legacy and ongoing relevance of Virilio's thought by inviting three scholars for whom Virilio's work has been important: Benjamin Bratton, McKenzie Wark, and Rey Chow. The conference will consist of three lectures, followed by Q&A sessions, and a moderated roundtable discussion.